In Green Lantern #56 Hal tracked down the Orange Lantern Bearer Larfleeze. He learned of the entity called Ophidian that was trapped inside Larfleeze’s lantern. Hector Hammond joining the party changed Hal Jordan’s plans. Hector Hammond fuses with Ophidian, yet Hammond seems to have most of the control. Hector Hammond by himself is already dangerous, but with the power of Ophidian he is a much more serious threat. Fearing that Hector Hammond may go after Carol Ferris, Hal heads to her last known location, Las Vegas. 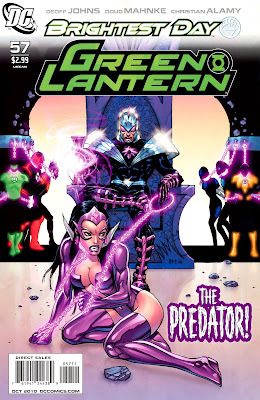 Star Sapphire Carol Ferris is in Las Vegas trying to track down the entity of love, The Predator. The Predator entity is corrupting people and trying to get them to realize true love. Obviously possessing someone and forcing their hand is intrusive, and Hal Jordan and Carol Ferris try to stop this. Yes this review seems really expository, that’s because Green Lantern #57 is difficult to talk about without giving away the entire story. And the story is the only thing noteworthy as there’s very little action in this issue. Most of the fight scenes leave you wanting more, and that’s not what I want from a Green Lantern comic. I want more spectacle and more use of the Power Ring; Green Lantern #57 doesn’t have that, and it would be okay if the premise was more intriguing, but it isn’t. This issue just feels like a set piece, and not what is indicative of the Brightest Day story arc as a whole. Or so I hope. Many different inkers lent their talents to Green Lantern #57. And some of the panels are really strikingly colored. Notably panel’s 19 & 20, which are vibrantly lit, and standout from the main artwork featured in this comic. Most of what happens in this issue happens extremely quickly. Each panel jumps to one scene and then the next, and there isn’t much cohesion with each piece of art depicted. In one panel Carol and Hal can be talking, and in the very next panel they are getting strangled. The visuals are really chaotic. And it seems like Geoff Johns really wanted to tell this story in one issue—it probably would have been better suited to be broken up into two or three. Green Lantern #57 tries to cram so much info into one issue that it becomes unfocused. It’s just kind of a “blah” feeling from beginning to end. And you get that the next issues will explore how Hal Jordan deals with the various other entities that are loose on Earth. But Green Lantern #57, as a standalone story, isn’t particularly enthralling.